Tented Area free of any center poles underneath. Perfect finishing touch for any ground cover to your tent. 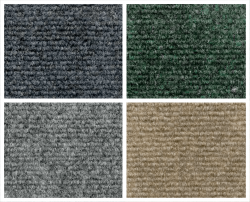 4 colors to choose from along with custom sizes. A deck may need to be built under if ground is not flat for the most part. 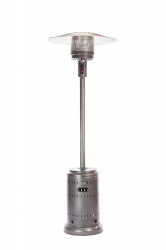 This fan can be installed in our complete lineup of tents and keep air moving so you and your guests stay cooler. 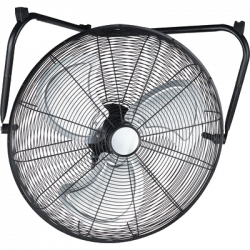 You can request this fan to hung in all corners of any tent offered, a small 10' X 10' OR 20' X 20' tent can have up to 4, a 20' X 40' tent can have up to 8 as example. Strand of Tent Globe Lighting. 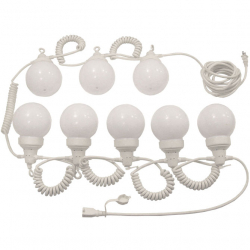 Attaching to the sidewall rope or cross wires in a Marquee tent with hooks on each globe, the coiled cord has a maximum stretch of up to 35' (10.7 m). 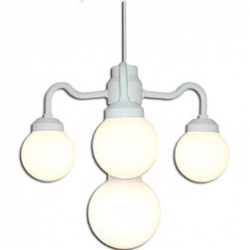 Strand Globe Lighting is weather and water resistant and intended for temporary outdoor use only. Will accommodate two six foot tables and 16 chairs or one round table with eight chairs. 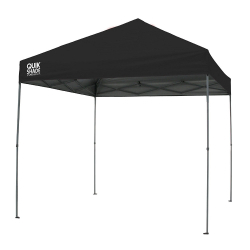 This tent is Black, White also available. Will accommodate two six foot tables and 16 chairs or one round table with eight chairs. 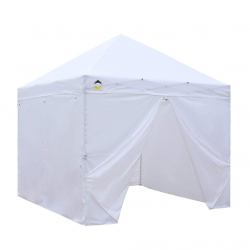 This tent is White, Black also available. Use anywhere you need privacy at an event. Mobile office, Changing Room, Storage or to do anything you don’t want others to see. Fans & Lights can be added inside if needed. 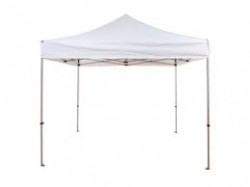 2 Feet Bigger in both directions than standard 10' x 10' Tent commonly used. Will accommodate four six foot tables and 32 chairs or two round tables with eight chairs each. 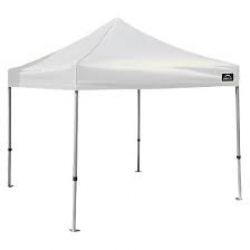 This tent is White, other colors also available for additional charge, Inquire. Tented Area free of any center poles underneath. Only four corner poles with cross cabling above for center pole. 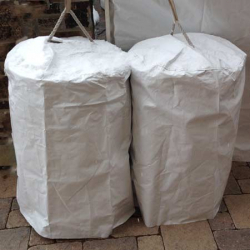 White, Clean & Classy for all venues and events from backyards to weddings. Tent will accommodate six rectangular six foot tables and forty-eight chairs or five sixty inch round tables and 40 chairs max. Tented Area free of any center poles underneath. Only six poles around edges with cross cabling above for center poles. White, Clean & Classy for all venues and events from backyards to weddings. 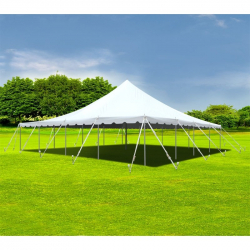 Whether you call it a party tent, canopy tent, event tent, wedding tent, or gazebo – this tent is sure to give you what you need! 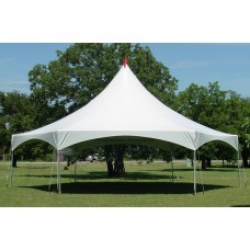 Used solo or as the center point to attach up to six more 20′ X 40′ Tents and seat Over 670 people. Each 20′ X 40′ additional tent added will add 72 -96 people for sit down or buffet style meal. Max seating is 676 people with six additional tents attached on each side. Triple High Peak Tented Area free of any center poles underneath. Only eight poles around edges every 20′ with cross cabling above for High Peak poles. White, Clean & Classy for all venues and events from backyards to weddings. 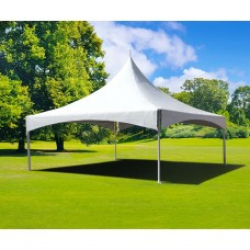 Quadruple High Peak Tented Area free of any center poles underneath. Only ten poles around edges every 20′ with cross cabling above for High Peak poles. White, Clean & Classy for all venues and events from backyards to weddings. 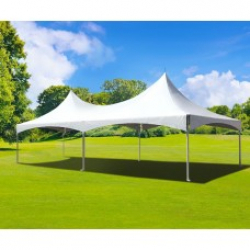 Quadruple High Peak Tented Area free of any center poles underneath each 20′ x 40′ section with one pole in center of 40′ X 40′ area. Only eight poles around edges every 20′ with cross cabling above for High Peak poles. White, Clean & Classy for all venues and events from backyards to weddings. 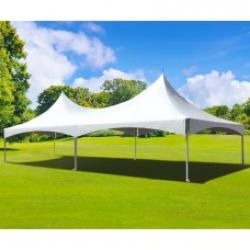 Sextuplet High Peak Tented Area free of any center poles underneath each 20′ 40′ Tented Area. 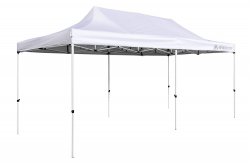 Only twelve poles every 20′ with cross cabling above for High Peak poles and 6 poles in center of tent. White, Clean & Classy for all venues and events from backyards to weddings.